Little alien baby 2.0 at 6 weeks. When I was pregnant with my daughter, I was depressed and didn't know it. I thought it was purely hormones (they certainly played a factor), but I deeply struggled with all the physical and emotional changes, feelings of isolation, and loathed the lack of energy and ruthless episodes of dry heaving. I thought it was normal to the feel the way I was feeling, I mean being pregnant is universally recognized as being straight up difficult, right? As we all can't avoid those pesky hormonal mood swings, my mood sunk to another level. And when I had my daughter, all that unrecognized, unmentioned depression during my pregnancy turned into a blind-siding and all-consuming bout of postpartum depression. 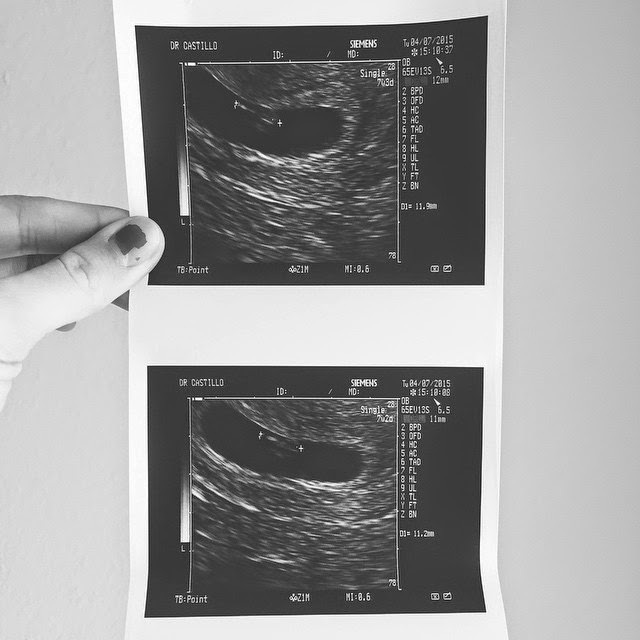 I give this back story, because, well I'm pregnant again. And I don't want to feel that way again, so I'm being proactive in taking measures to ensure I can actually make these nine months a good nine months. This time I'm aware. This pregnancy, though early, is proving to be very similar to my last, so I'm taking action in making sure these next nine months are easier and more enjoyable. Making exercising a priority during my "good hours". Especially during the first trimester, the fatigue feels insurmountable. It's unnecessary to push yourself when you know you need to rest. So rest when needed but recognize the time of day when you feel your best. For me, it's at night, so I try to squeeze in some light yoga even if it means the dishes have to wait. Keeping healthy, cold beverages and snacks on hand. I didn't know how to handle the dry heaving last time I was pregnant, since it's unlike the typical nausea. Crackers and ginger didn't do. I recently learned that anything cold helps to relieve that sensation. So ice cold water, straight up ice, popsicles, and refreshing fruit are my secret weapons of choice. Penning in me-time. As moms, me-time is the first thing to go when we're busy, but I've decided to pen (not pencil) in me-time. Get my hair done, get a pedicure, simply buy and enjoy a magazine are a few things I'm looking forward to. This one is a non-negotiable. Being kinder to myself and lowering expectations. During my last pregnancy, I would get so easily frustrated with myself. If I didn't have it in me to make dinner and we got take-out, I'd worry about our budget. I was (a little too) strict on my budget for maternity clothes, and I couldn't handle the dishes being unwashed. It seemed like everything ended with me in tears. I was too hard on myself. This time I'm going to be okay with the fact that the dishes might not get done, allow take-out as an okay option for dinner, and budget in a splurge here and there. Remind myself it's all temporary. Last time, I felt like I was never going to feel like myself again. But there came a point when the engorgement became old news (thank God), I started losing a couple pant sizes, my energy levels increased, and (with help) the anxiety and depression got under control. Though there will be good days and bad days, I'll remind myself on the bad days that the physical discomfort will pass and stay focused on the fact that soon sweet Ella will have a sibling. And that's what matters. There are some people who feel their best when pregnant. We all have different experiences, and it's okay if you don't completely and wholly enjoy pregnancy every waking day. If you're one of these people, I hope these tips can help you, too!